The MWA represents most of the biggest North American INGOs, and as such a huge combined total of WASH sector activity. We conservatively estimated that their aggregate contribution to Honduras’s WASH sector in the last five years was more than 20 million $US. Not only do Catholic Relief Services, CARE, IRC International Water and Sanitation Centre, Living Water International, Water.org, Water For People, World Vision, contribute a lot of money (possibly as much as 25% of total sector financing), but they are present in a large portion of the country (as shown in the map) and are there for the long term. Imagine then, how potent they could be as a force for positive change if they were to align their programme to a common set of principles and operating practices. This is what is being tried in Honduras under the “Everyone Forever” banner. embedding all of the municipality level work deeply into national structures and thus creating a bottom up (mayor to mayor) and top down movement to replicate and scale what has been achieved in the municipalities. At the heart of EF is a deep commitment to putting municipalities at the heart of service delivery, to support them, to champion them and to building on the energy this creates to achieve a movement that leads to full coverage. The beauty of the EF approach is that it starts with a vision – not a set of pre-prescribed ‘solutions’ – and an approach to working that is based on principles and an openness and willingness to learn. To support this learning and to ensure coordination and embedding at the national level, the MWA members are supporting the inception of an “EF hub” in Honduras. This hub will aim to coordinate activities across the movement – ensuring alignment and learning between MWA members and reaching out and linking to other networks and actors – such as the Mesa de Cooperantes or the national water rural water network (RAS-HON). This is the start. There’s a lot to do and a lot to learn along the way. Aligning the programmes of seven INGOs across – initially – 12 to 20 EF municipalities will take a lot of working out. 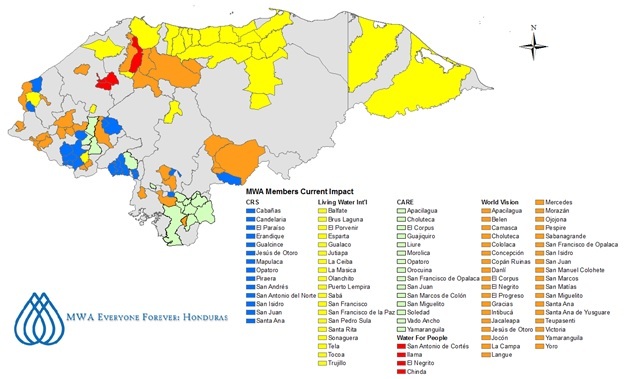 However, as Paul Hicks of Catholic Relief Services said during the meeting, Honduras has what is probably the most vibrant WASH sector of the region and some of the strongest and most empowered municipalities. We’re hugely excited about the potential that the MWA EF programme has to build on this energy and enthusiasm to achieve a transformation in how lasting water, sanitation and hygiene are brought to all Hondurans. A real miracle! Reblogged this on Rural Water Supply Network – Blog. Great summary! As Malcolm Milton eloquently put it, “let’s get’r done”. I knew that progress was being made in Honduras but this is truly impressive. Hopefully this can serve as an example for organisations in other countries to work towards alignment and the application of similar principles.